Four very different free plugins. 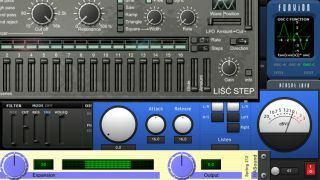 A nicely varied collection of software for you this week, as we bring you audio processors to help add stereo width and get rid of sibilance, a filter and a hybrid synth. This level-independent sibilance processor is said to be a new type of de-esser that offers automatic sibilance detection. It does this by tracking the amplitude and pitch of its input in real time - set the reduction amount and Lisp will work on eliminating those unwanted 'ss', 'the', and 'ch' sounds. A simple state-variable filter (low-pass, high-pass, band-pass, band reject) that enables you to control the cutoff frequency via either the 16-step sequencer or the LFO. Modulated filter patterns are easy to create, so we're told. If you're mixing music for systems that have stereo speakers in close proximity - boomboxes, for example - HASound thinks that this stereo expander plugin will help you to add a bit of width. A hybrid 3-oscillator synth that comes with user-definable functions for waveforms and distortion. Other features include three LFOs, three ADSRs, a randomizer, a multimode filter and two delay units.